Alzheimer’s disease is the most common form of dementia, a progressive decline in cognitive function due to damage or disease. Alzheimer’s is a progressive and fatal brain disease, which destroys brain cells and causes problems with memory, thinking and behavior. In June 2008, the Centers for Disease Control and Prevention (CDC) National Center for Health Statistics reported that Alzheimer’s disease surpassed diabetes as the sixth leading cause of death in the United States . Although the cause and progression of Alzheimer’s disease is not well understood, research suggests an association with plaques and tangles (meaning pathological protein deposits and aggregates) in the brain . Parkinson’s disease is another neurodegenerative disorder that progressively impairs a person’s speech and motor skills. Parkinson’s disease is characterized by muscle rigidity, tremors and a slowing and loss of physical movement. The disease occurs when neurons (nerve cells) in the brain become impaired or die. 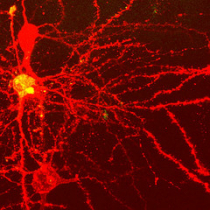 Neurons normally produce dopamine, a neurotransmitter responsible for transmitting signals that produce smooth, coordinated function of the body’s muscles and movement. Neural stem cells hold the promise as a source of dopamine-producing cells to replace the degenerating nerve cells in Parkinson’s patients. Unless we do something to prevent it, over the next 40 years we’re facing an epidemic of neurologic diseases on a global scale. Why? Because biomedical research and better healthcare measures have enabled people to live longer. The average lifespan is increasing and the world population is getting older. In fact, Petsko states that the average lifespan is increasing at the amazing rate of ~5 hours everyday. Alzheimer’s and Parkinson’s disease usually affect individuals that are middle aged or older. Petsko’s solution? More research into the brain and its function. Check out his short 4 minute talk below. More information can be found at the Alzheimer’s Association and The National Parkinson Foundation. New Studies Probe Role and Form of Brain Protein that May be Responsible for Impaired Memory in Alzheimer’s Disease. Society for Neuroscience press release. 2008 Nov 16. Research Reports Discovery of New Sources of Neural Stem Cells. Society for Neuroscience press release. 2008 Nov 18. Deaths: Preliminary Data for 2006. National Vital Statistics Reports, Volume 56, Number 16. 2008 June 11. Tiraboschi et al. The importance of neuritic plaques and tangles to the development and evolution of AD. Neurology. 2004 Jun 8;62(11):1984-9. Genes, Lifestyles, and Crossword Puzzles: Can Alzheimer’s Disease be Prevented? U.S. Department of Health and Human Services. 2006 June.